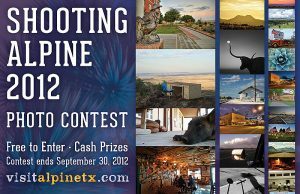 The City of Alpine, Texas is pleased to announce the 2012 Shooting Alpine Photo Contest. The contest entries are now available to view here. Free and open to the public, this contest is an opportunity for our visitors from near or far as well as local community members to showcase their photographic talent. Photographers are asked to capture the city of Alpine, Texas (and/or its surroundings) in a personal, reflective way to reveal the personality of the town through their eyes. The city itself has a rich history, a variety of architectural and natural landmarks and scenic views of all types and sizes. Through the photographer’s own lens and outlook, Alpine’s persona will bloom with high-quality, inspired and surprising imagery. The contest will be judged by Marathon-based photographer James H. Evans (www.jameshevans.com). James has been living in and photographing the Big Bend region since 1988. He has two books, Big Bend Pictures (2003) and Crazy From The Heat (2011). He has been a contributor to Texas Monthly for over 20 years, and his work is in many Texas museums and private collections. He has a photo essay in the September issue of Texas Monthly, and is working on his third book of photographs. Click here to view the winners, finalists, and all of the entries from the Shooting Alpine 2011 Photo Contest! Entries will be accepted through September 30, 2012 (The contest time period is when entries can be submitted. Photos can have been taken at any time). An online entry form and upload functionality will be available during the period of the contest. Winners will be announced before the end of November, 2012.